The perfect setting for both lavish entertaining as well as intimate gatherings, those at the pinnacle of success will appreciate the grand spaces yet peace and solitude offered by this remarkable home. Lounge by the breathtaking pool and spa gazing the impeccably manicured, mature grounds, while inside sophisticated systems add to the home's cachet including fiber optic wiring, advanced “LiteTouch” lighting system and state-of-the-art home theater, uninterrupted via a home generator. 8 Bedrooms, 6 1/2 baths, 4 car garage, 3 fireplaces, grand open spaces, soaring ceilings, custom moldings and Brazilian cherry hardwood flooring throughout, two-story library, high-tech systems, state-of-the-art theater, whole-house generator, spectacular 1.5 acre property with heated in-ground salt water pool, cabana, sports court and so much more. 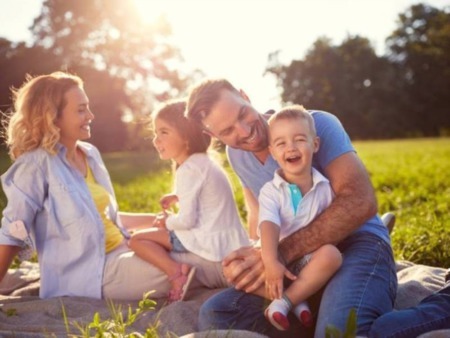 Vacationing away from home will be a distant memory. Entry to this magnificent home is accessed from a quiet street, up a winding drive through a set of front entry columns, creating a commanding presence and promising no less. 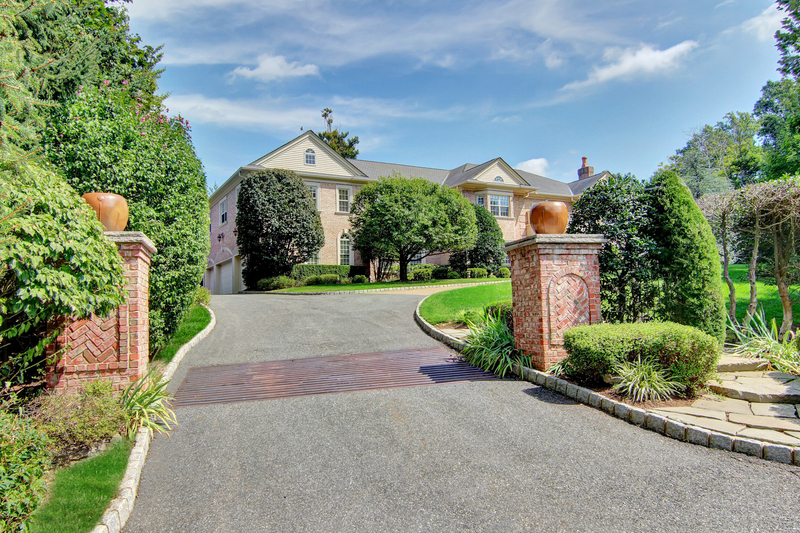 Peace and privacy abound in this idyllic setting, feeling far from the world yet only a few minutes from the Short Hills NJ Transit Train Station which offers convenient service to both Hoboken and New York Penn Station. 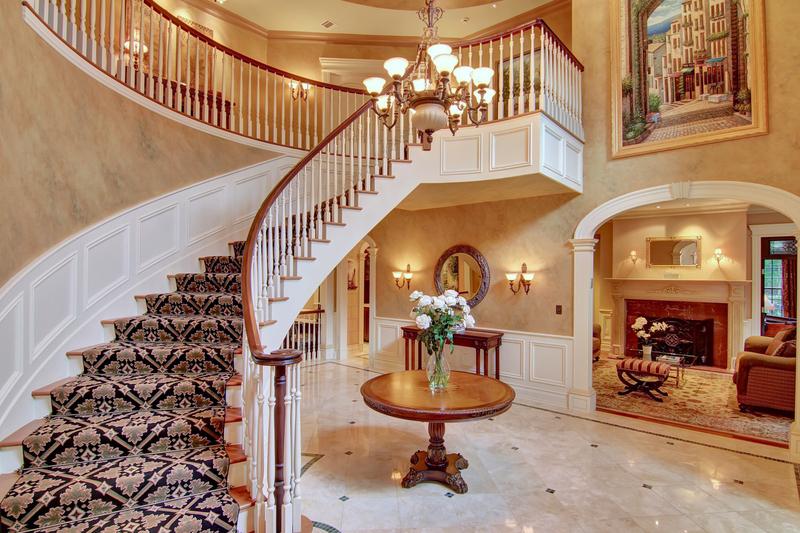 The impressive Entry Hall, with winding staircase, custom doorways, soaring ceilings and two coat closets, offers guests a glimpse of the grandeur that awaits every turn. Flanking the Entry Hall are an elegant fireside Living Room and banquet-sized formal Dining Room both boasting bay windows and offering spaces that are perfect for both intimate gatherings and large events. 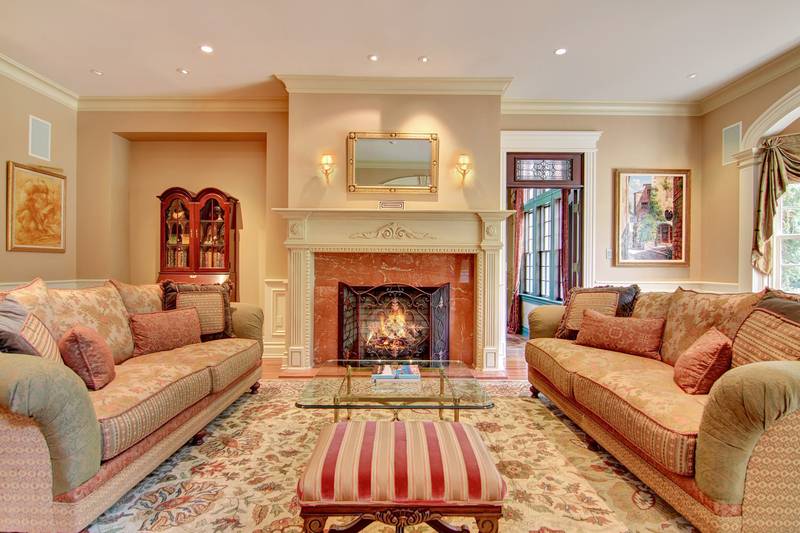 Anchored on beautiful hardwood flooring and set beneath a high celing with beautiful moldings, a large bay window and architectural interest at every turn, the fireside formal Living Room is elegant, welcoming guests with warmth and grandeur. Off the Living Room, a two-story Library with walls of windows and custom built-ins is tucked away in a corner of the home for privacy. 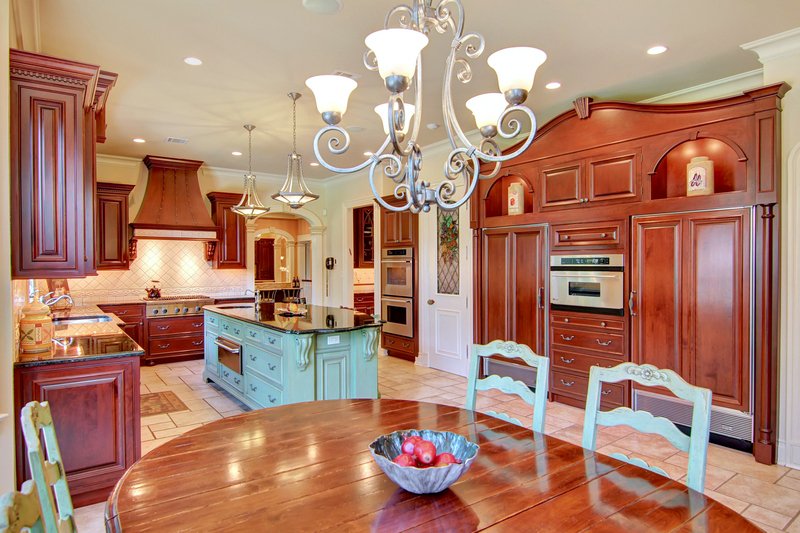 It is expansive, with soaring ceilings and four sets of two-story windows. 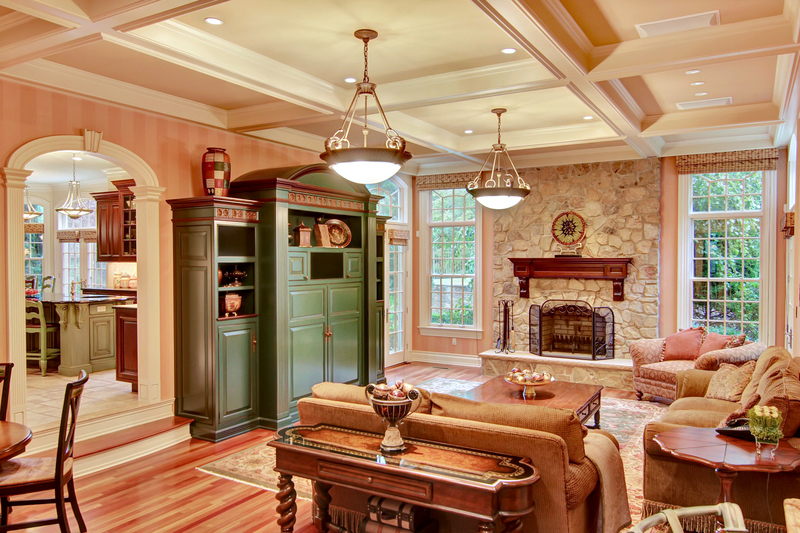 Bright, cheerful and inviting, it is the perfect space in which to work, relax or entertain. 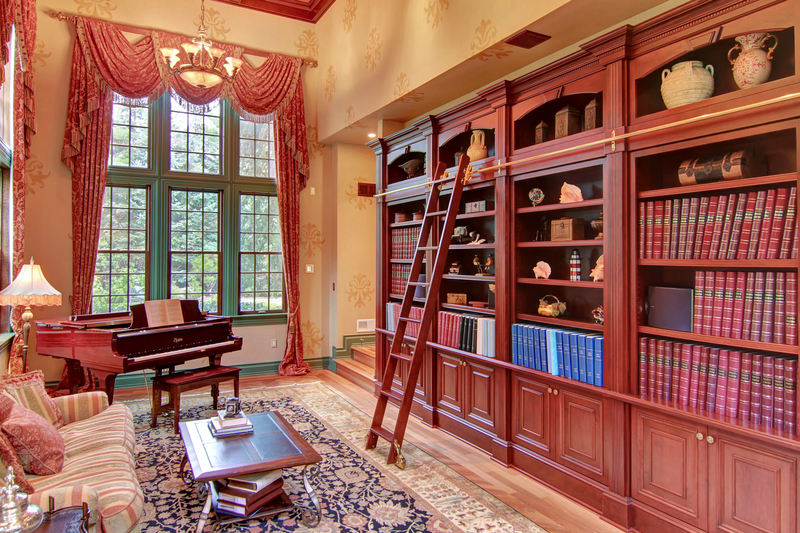 A rare find in Short Hills and a very special feature in this impressive home. 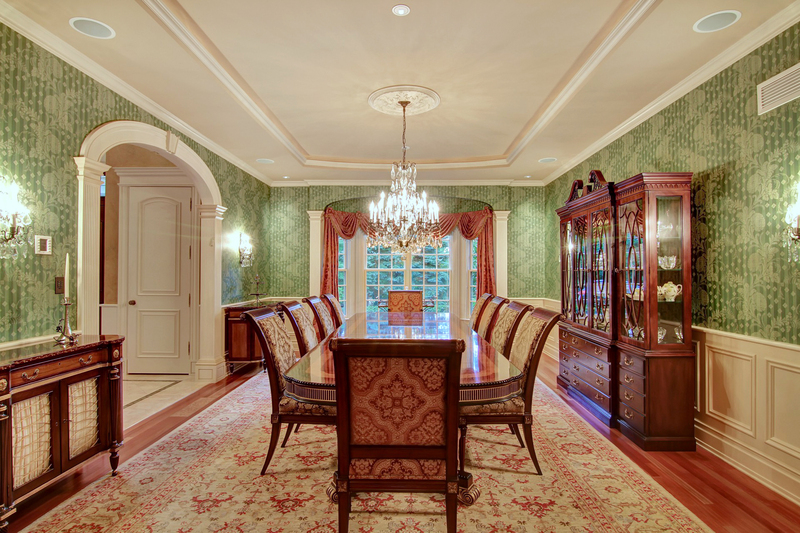 A banquet-scale formal dining room with custom wainscotting and large bay window sets the tone for lavish entertaining under a dramatic tray ceiling, offering the perfect space for both small and large dinner gatherings. Holidays and every day will offer a very special experience. At the very heart of the home is the spacious Kitchen with walls of windows offering complete visibility to the resort-like rear property. The gourmet Kitchen is high-end, embellished with custom cabinetry, granite countertops, radiant heated floor, 6 burner Thermador range top, Thermador double electric convection ovens, Miele dishwasher, Subzero refrigerator, Subzero freezer, GE Monogram convection microwave and oversized center island with seating, Thermador warming drawer and additional sink. The convenient Butler's Pantry features yet another Miele dishwasher, Thermador electric convection oven and sink. Nearby is the epitome of effortless gathering: a large family room boasting a focal floor-to-ceiling stone wood burning fireplace with gas starter. The room features eleven foot coffered celings, a built-in entertainment center, two pairs of French Doors that open to the rear property, built-in speakers and hardwood flooring. A wet bar with round copper sink, ice maker, refrigerator, wine refrigerator, granite countertops and custom cabinetry with ample storage offers the ultimate in convenience. 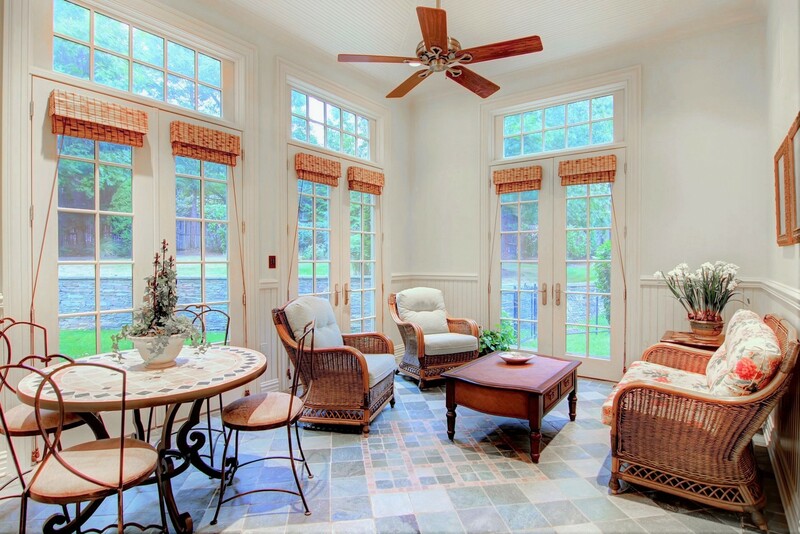 This substantial room opens into a bright sunroom that features radiant heated tile flooring, walls of windows and a comforting ceiling fan overlooking the manicured and mature grounds. The first floor also boasts a generously-sized private first floor bedroom with walk-in closet, making even the most finicky of guests feel at home. Connected to the bedroom is an ensuite with oversized shower and custom hardware, custom vanity with marble countertop and tile floor with hardware-matching bronze inserts. A four-car oversized garage is also accessed from this level. The upstairs hall is bright and dramatic with lofty views of the Entry Hall below, accessed by a grand staircase leading to 6 spacious and bright bedrooms. 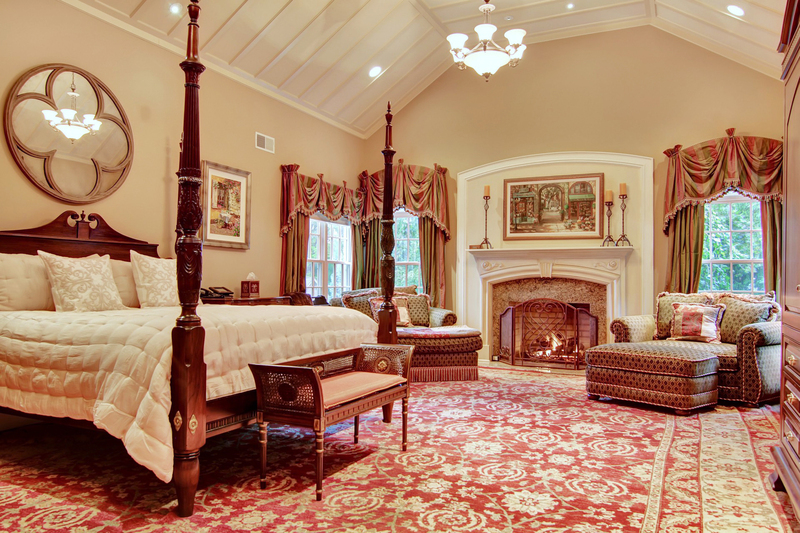 The luxurious Master Suite is reminiscent of a Bed and Breakfast, offering the homeowner a serene, generously sized fireside bedroom with soaring ceiling and winding stairs leading to a private loft area. The bedroom offers generous views of the perfectly manicured grounds. The Master Bath features large windows, a radiant heated tumbled marble floor with inlays, an oversized double vanity with built-ins on either side, large walk-in shower, spa tub, make-up vanity and separate Toto commode. 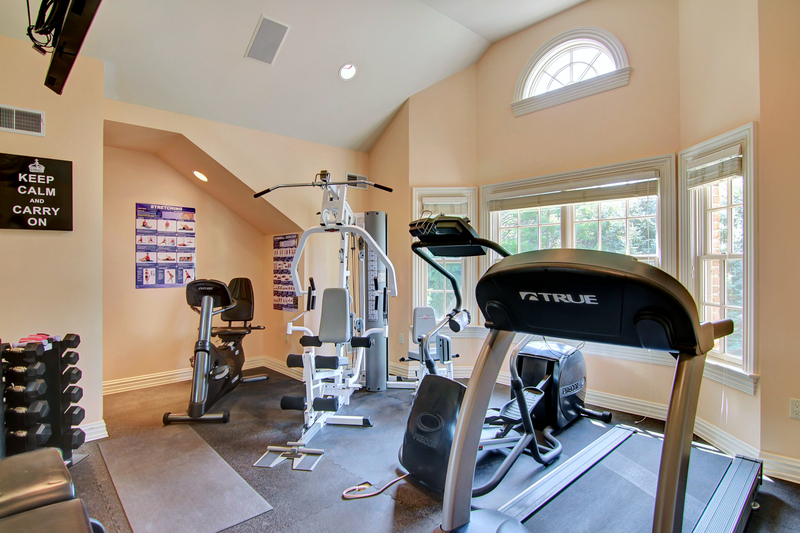 Nearby is a second floor exercise room, offering the ultimate in convenience and good health. Two of the additional second floor bedrooms offer ensuite baths, high ceilings, walk-in closets, built-ins and/or elegant moldings. A rear staircase, from the lower level to the second floor, offers convenient access from the heart of the home to the bedroom quarters, while another staircase leads to expansive third floor storage. A home office in one of the second floor bedrooms is oversized, with custom built-ins on three sides and extensive storage. Commuting to the office will become entirely unnecessary. One of two laundry centers is located on the second floor, adding convenience. 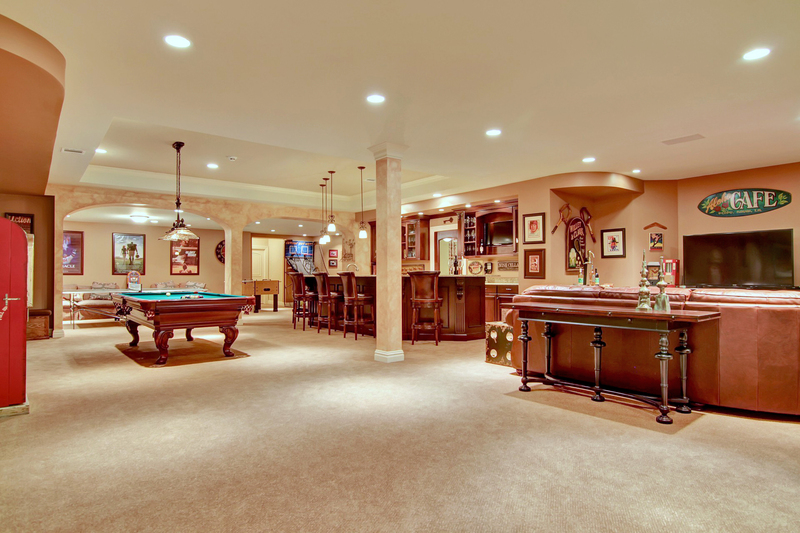 The Lower Level is expansive, with an assortment of rooms created for the individual tastes of its occupants including a Recreation Room, state-of-the-art Home Theater, full service wet-bar with seating for 10, wine closet, an additional bedroom with nearby full bath, two utility rooms and several storage rooms with custom built-in shelving. A second laundry center resides on this level. 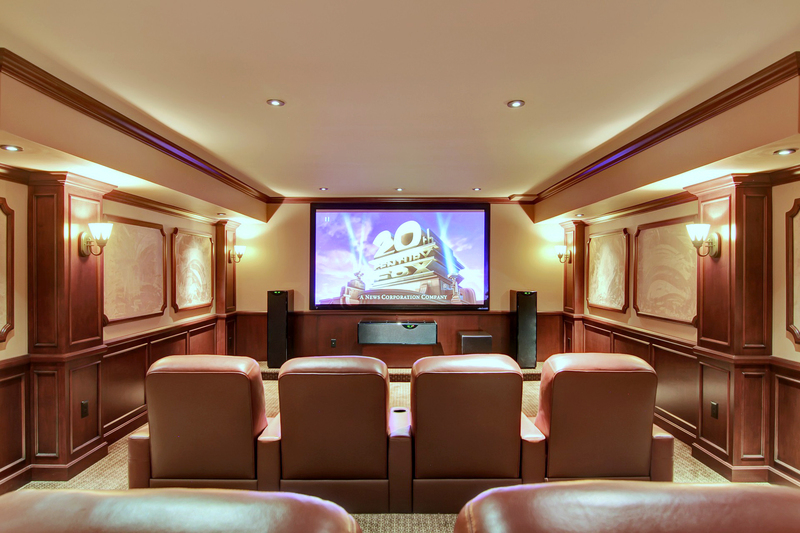 The state-of-the-art home theater is impressive and exceptionally comfortable, featuring a high-end home theater control system and Meridian speaker system, twelve leather reclining chairs on three levels, handcrafted wood paneling, six custom wall sconces, sound deadening wall panels and luxurious carpeting. The grounds are breathtaking with expansive sweeping lawns and privacy all around. The custom bluestone terraces and patios across the rear of the property offer delightful views of the lush park-like property. From morning coffee to late night dinner parties, there isn’t a more perfect place to start or finish the day. 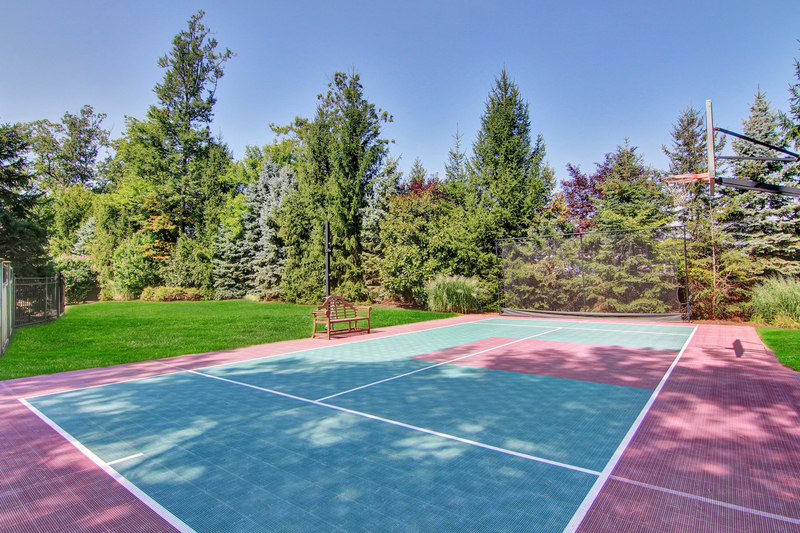 A sports court offers the ultimate in outdoor recreation. 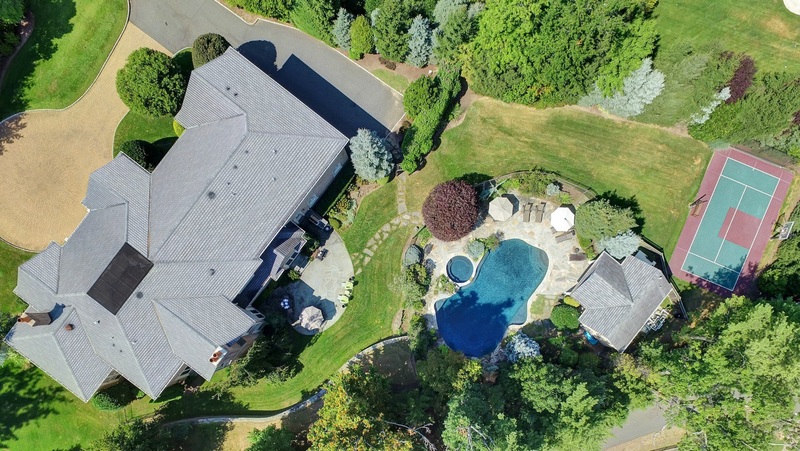 At the end of the sweeping lawns is a wonderful surprise -- an idyllic heated in-ground pool, totally secluded from the rest of the world offering a tranquil retreat from the warm summer sun. The nearby cabana affords easy outdoor entertaining with refrigerator/freezer, sink and microwave oven as well as a convenient powder room, shower room and changing room. The technical systems are exactly what one would expect in a home of this caliber, with sophisticated state-of-the-art heating and cooling systems featuring radiant heat in many tiled areas of the home, security systems, fiber optic pre-wiring, sophisticated lighting and music systems, telephone system and whole-house built-in natural gas generator.